Dear Underexposed: There’s no hard-and-fast rule here—you kind of need to use your spider-sense to determine whether it fits your business model. I do plenty of guest posts elsewhere for free, because I enjoy it, it is good for exposure and link love, and it encourages guests to share their wisdom here. (Best-selling author Chris Anderson, whom I interviewed for Speaker magazine, has made a career out of extolling the virtues of free. Lining up on the other side of the argument is legendary sci-fi writer Harlan Ellison, who said, “I sell my soul, but at the highest rates.” And we all know how the Huffpo fiasco worked out.) Somewhere in the middle ground, I’ve written on the lower end of the pay scale when I’ve been trying to break into a new market. You say it’s a popular website, but just how popular? Are we talking a couple of thousand hits a month…or millions? Is a clip from this website going to give you a legitimate piece that you can add to your portfolio and tout to prospective clients? Will they allow you to put a brief bio and a link to your website or blog, or an email address for people to contact you directly? One of my regular niche magazine gigs has been a decent source of referrals as well as the pay for the articles. If you do write something for them, is it a 1500 word story that’s going to take tons of interviews, research and effort, or is it something you can write quickly and easily based on your expertise? Did you ever ask directly if it is a paying job? Do they pay for other content, but just not in this case? From your initial comment, it sounds like you may not have asked, but doing so politely might be worth it. It sounds like she’s interested in what you can contribute, so the worst she can say is “no pay,” right? How busy are you right now? Could the time be better spent cold calling for new clients or extending your marketing efforts with existing ones? Really, it comes down to writing down an old fashioned Ben Franklin pros and cons list, and deciding which way it tips. I’m curious to know what decision you make and how it turns out, so please share anonymously in the comments when you get the chance! Doctor Jake, I think you know my take on this. Any time someone needs your copy, that indicates your work has value. I like all your points. If you know going in it’s charity, then you can make your decision based on that knowledge. I think I’d add this question – how much money will THEY make from it? We all remember Arianna Huffington’s infamous sale and the writers’ shock after the fact. I’d much rather place a dollar value on it for the recipient of my work before deciding if they truly can’t afford to pay me. Great advice, Jake. It really is a case-by-case analysis. For example, I wrote an article in a health reform magazine that totally runs on the backs of experts writing their content. While it somewhat rubs me the wrong way, I still get inquiries and some business from that single article (written almost 2 years ago). It included my bio with links and established my credibility. So, in that regard, it paid off. On the other hand, I recently had an insurance broker (a targeted market for me) inquire about me posting to their blog in exchange they would deliver guest posts for my blog. I didn’t see the win/win like they did. By me posting on their blog, I am not hitting my targeted market (I’m hitting theirs). Heck, I have paying gigs writing for broker sites. So, the answer really is it depends. If this is essentially a guest post, find out how many links you can add to your site in the bio, along with important keywords in those links. And I agree with Jake — you need to know how many people will read your post, and if they are the kind of people that can help your business in some way. Good additional thoughts across the board—thanks! @Lori, indeed. If HuffPo didn’t cure the naivety epidemic, I’m not sure what will. @Cathy, when you look at it from a Long Tail perspective, it can pay off. Had to chuckle at “it depends,” because just about question WRT freelancing can be answered with that…then again, it’d make a darn boring blog 🙂 But you *have* sparked an idea for a Freelance Follies video, coming soon to a YouTube theatre near you. So, thanks! @John Soares, excellent thought on imbedding as many links and keywords as you can get away with. Yes, by all means before you give it away ask for pay! You might be pleasantly surprised – hey, it happens. I’m of the middle ground too Jake, and think you’ve pretty much nailed it with the questions you suggest. 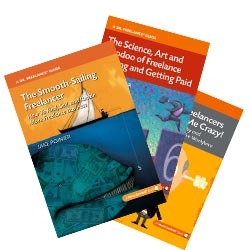 I’ve written for free and had it work, written for free and had it not work. But I also smell a rat in the question… if the writer is an expert they probably know the site in question, right? Wouldn’t they know if it’s an honor or hokum? Thanks for dropping in, Anne, and for reinforcement of my “it depends” answer! Cathy, I’ll try to live up/down to my FF rep.